11SX fulfills each and every requirement. The stainless steel inner link and the innovative high-grade nickel coating make this chain extremely resistant to corrosion. Also it features the latest plate geometry shaped for the very best shifting performance. 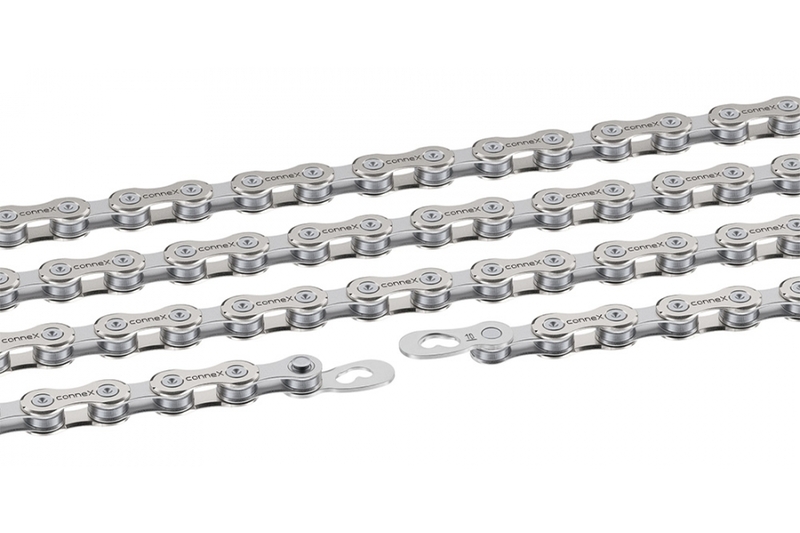 Connex 11-speed chains are perfectly suited for the latest generation of shifting systems, which are used in state-of-the-art mountain bikes or road bikes for example. The Connex11sX top model with stainless steel inner links provides maximum wear resistance. Speed Wing, the innovative outer plate, ensures particularly rapid and silent shifting on Connex 11-speed chains. The newly developed peripheral chamfering of the outer plate ensures optimum chain guide and gear-changing performance. And for optimal absorption of the high shear forces through extreme transmission, Connex have implemented a completely innovative process for radial riveting. This process, in combination with a special pin coating, guarantees top performance and long wear. Best chain money can buy. On time and very good price, thank you. I have a good experience with these chains. I use it with 105 11S. Excellent switching, silence .... I use 3 chains in a circle, I ride 70% flat. 3 chains and one cassette, with lubrication every 200-300 km, I have enough for 15-17K. Thank you Merlin for a good price and excellent customer service !!! My reason behind buying this chain was the many reviews that stated this was probably the best chain for a silent drivetrain and had the added benefit of a hands only chain link for easy removal. I regularly remove my chain and have recently started using hot wax (with additives) instead of regular chain lubes. This chain has proved to be exactly as the reviews all stated. Great quality chain, feels more solid than Campagnolo, Shimano and SRAM chains. Now I have it installed and is smooth, silent and clean. Price from Merlin is the best so will be buying a couple more so I can rotate 3 or 4 chains as the wax wears. The quality of material and finish in this chain is a step apart from the Shimano and Sram. Shifting is as good as the XTR/Dura Ace equivalents... will wait and see on durability. The link is the very best in the business, the fact it is so easy to remove and reconnect a chain is in itself worth the extra money. Second chain - bought as a spare when one in use is worn out. Easy to fit and with the Shimano 105 set up, chain works perfectly. While more expensive than other brands, I do like the fact that the connecting link is reusable. 600kms and no sign of wear, so I expect to get about a year's riding out of it (7000kms). Exactly what I ordered, quick delivery to Australia, first 50km of use no problems. Removable link comes with chain and fantastic to use, it is very easy to remove and install with little effort required. I think the chain and link is a very good quality and durable item and would recommend to anyone. Just be aware the removable link is directional.